The Governing and Conception Vessels are the main rivers of the body’s Yin and Yang energies. They are polar aspects of the body, perfectly complementary, like midnight and midday. They are responsible for the formation of the holoblastic cleavage and the first cellar division of the fertilized ovum in embryological development.The Governing and Conception Vessels each have two energy flows on the anterior and posterior vertical midline of the body. Each vessel’s pathway is complete, being composed of an ascending energetic flow and a descending energetic flow. The duality of these two medial lines joins at the extremities (the head and perineum), forming one complete circle of energetic current. Both vessels are superimposed on each other, with the energy of the Governing Vessel being predominant up the back and inferior down the front (behind the Conception Vessel); the energy of the Conception Vessel is predominant up the front and inferior down the back (behind the Governing Vessel). Governs growth and development, drive and desires, ambitions and creativity. Represents the bronchi, the immune system, allergies and the skin. Least important of the Zang organs. Sometimes it is considered a subset of the Small Intestine. 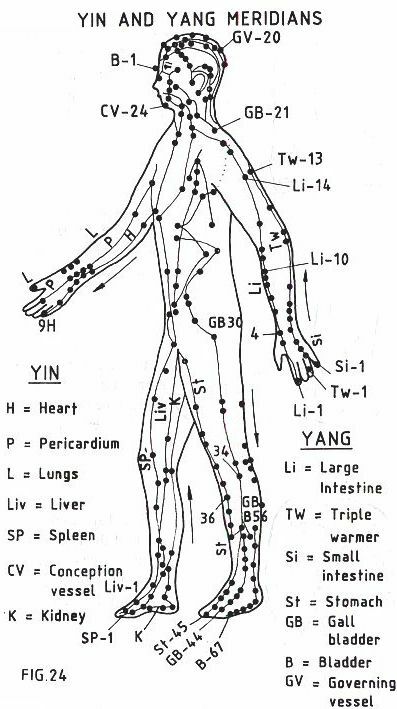 In Chinese medicine, the function of the Spleen organ-energy system includes the Pancreas. Responsible for analytical thinking, memory, cognition, intelligence, and ideas. It is not a single self-contained organ, but rather a functional energy system involved in regulating the activities of other organs. It is composed of three parts, known as ‘burners’, each associated with one of the body’s three main cavities: thorax, abdomen, and pelvis. Sometimes called the Triple Warmer Organ because the three body cavities are intended to control the body temperatures. The Upper, which relates to the chest above the diaphragm. It controls the intake of air, food, and fluids. It harmonizes the functions of Heart and Lungs, governs respiration, and regulates the distribution of protective energy to the body’s external surfaces. The Middle, which relates to the area between the diaphragm and navel. It controls digestion by harmonizing the functions of Stomach, Spleen, and Pancreas. It is responsible for extracting nourishing energy from food and fluids and distributing it via the meridian system to the Lungs and other parts of the body. The Lower, which is located below the navel. It is responsible for separating the pure from the impure products of digestion, absorbing nutrients, and eliminating solid and liquid wastes. It harmonizes the functions of liver, kidney, bladder, and large and small intestines and also regulates sexual and reproductive functions. Represents the entire pelvic area including prostate, uterus, testicles and ovaries and therefore also the sexuality.